Laser vision correction is a procedure that improves vision by permanently changing the shape of the cornea (the clear covering of the front of the eye) with a laser. Often referred to as LASIK (an acronym for the medical term laser assisted in-situ keratomileusis), it is the most commonly performed type of laser procedure and an effective treatment for a wide range of vision problems. How does the laser know what to correct in my eyes? 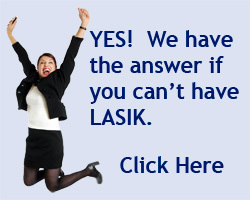 Laser vision correction is based on precise measurements of the imperfections in your vision. These measurements are taken with a powerful measurement tool known as the WaveScan®. The WaveScan information is transferred to the laser to guide the treatment. WaveScan technology provides a measurement and a visual representation of your vision based on the behavior of light waves. It compares light passing through your eye to the same light pattern from an eye that needs no vision correction. The WaveScan, captures the unique imperfections of a person´s visual path. WaveScan technology identifies and measures imperfections in an individual´s vision 25 times more precisely than standard methods used for glasses and contact lenses. What is CustomVue ™ laser vision correction? VISX CustomVue ™ is an individualized laser vision correction treatment that is WaveScan–guided. This enables a doctor to measure and correct unique imperfections in each individual´s vision that could never be measured before with standard methods used for glasses and contact lenses. With the CustomVue procedure, nearsighted and astigmatic individuals have the potential to achieve a new level of vision that we call Personal Best Vision. What do you mean by Personal Best Vision? Personal Best Vision refers to the new level of laser vision correction that can be achieved with the CustomVue procedure. Since WaveScan technology can measure and correct imperfections that are unique to each individual´s vision with 25 times more precision than standard measurements for glasses and contact lenses, individuals can potentially achieve the best possible vision for their eyes. How does the CustomVue procedure work? First, the WaveScan technology measures the imperfections in the eyes. Then, the treatment information is transferred to the VISX STAR S4 ™ laser. The doctor then uses that information to fine–tune the procedure thereby providing a new level of precision and accuracy. What can the CustomVue procedure do for me? As shown in the clinical study, CustomVue has the potential to produce better vision than is possible with glasses and contact lenses. It tailors a distinct correction for each individual–in fact each treatment is "designed" by the unique characteristics of your individual eye. What does better than 20/20 mean? 20/20 is the current standard for excellence in vision. But, as shown in a clinical study, individuals with the CustomVue procedure have the potential to see even better than 20/20. In fact, one year after the CustomVue procedure nearly 70 percent of clinical study participants saw 20/16 or better. Can the CustomVue procedure improve my night vision? Yes, potentially. In the clinical study, four times as many people were very satisfied with their vision at night after the procedure as compared to their night vision before the procedure with glasses and contact lenses.